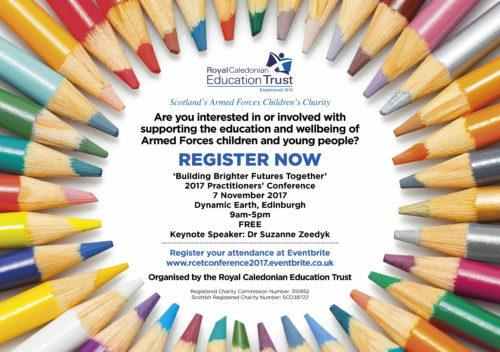 The Conference, which is free to attend, is open to professionals interested in or involved in supporting the education and wellbeing of Armed Forces children and young people. The keynote speaker is Dr Suzanne Zeedyk, honorary Fellow and Senior Lecturer within the School of Psychology at the University of Dundee (Scotland). In 2011, Suzanne stepped away from a full-time academic post to help individuals, groups and organisations understand everything science has discovered about the importance of emotional connection for human health and happiness. Over 40,000 people have attended her speaking engagements. 1600	Concluding Remarks, Malcolm Noble, RCET Chairman. Conference concludes with refreshments and networking.